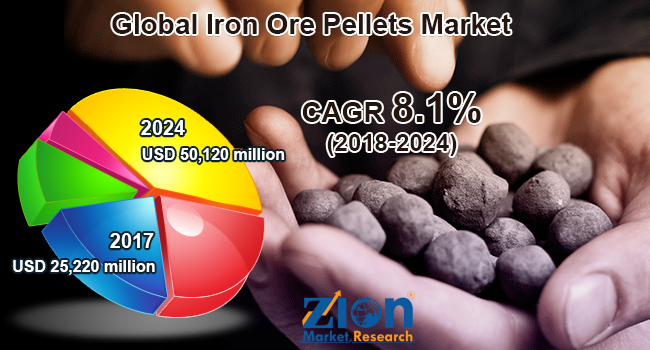 Zion Market Research has published a new report titled “Iron Ore Pellets Market By Type (Hematite, Magnetite, and Others) and By Application (Steel and Other Applications): Global Industry Perspective, Comprehensive Analysis, and Forecast, 2017–2024”. According to the report, the global iron ore pellets market was valued at around USD 25,220 million in 2017 and is expected to reach around USD 50,120 million by 2024, growing at a CAGR of 8.1% between 2018 and 2024. Iron ore pellets are one of the essential raw materials used by the steel industry for steel production. Iron ore pellets help in the rapid expansion of the steel sector as well as assist in sustaining the global economy. The iron ore pellets market is driven by the increasing demand from the steel industry and new developments made related to manufacturing activities. However, the fluctuating prices of raw materials might impede this global market. Nevertheless, the increasing demand for high-grade and high-quality iron ore pellets are likely to fuel the iron ore pellets market globally over the forecast years. The iron ore pellets market is segmented based on type and application. By type, this market is categorized into hematite, magnetite, and others. In 2017, the hematite segment held the largest market share (around 65%) in the iron ore pellets market. This segment is likely to be the fastest growing during the forecast time period, owing to its high density and cost-effectiveness. Hematite beneficiation generally involves a combination of various beneficiation techniques. Magnetite held the second largest share of the iron ore pellets market, owing to its increasing use in the blast furnace and steel production. By application, this market is segmented into steel and others. The steel industry is considered as the largest consumer of iron ore pellets, as they are utilized in blast furnaces of steel manufacturing plants for producing steel, which is used largely for the construction of bridges, cars, planes, etc. Asia Pacific region is likely to exhibit a high growth potential in the iron ore pellets market in the upcoming years. This is due to the thriving construction activities in the region’s emerging nations, such as India and China. The construction sector in these developing economies contributes nearly 30% of the GDP, which, in turn, is predicted to generate huge demand for iron ore pellets during the estimated timeframe. Europe and North America are projected to experience a moderate rate of growth over the forecast time period. The Middle Eastern and African and Latin American markets are anticipated to exhibit a significant growth rate in the years to come, owing to the increase in the construction activities and industrial development. The key manufacturers operating in the iron ore pellets market include Vale, LKAB, Metso Corporation, Arya Group, Iron Ore Company of Canada Inc., METALLOINVEST MC LLC, Simec Group, Cleveland-Cliffs Inc., Jindal Saw Ltd., Ferrexpo Plc, and Xindia Steels.